There are many relics that remind of the four war years, 1914-1918, to be found in the Ypres region, such as sites, monuments, cemeteries and landscapes. 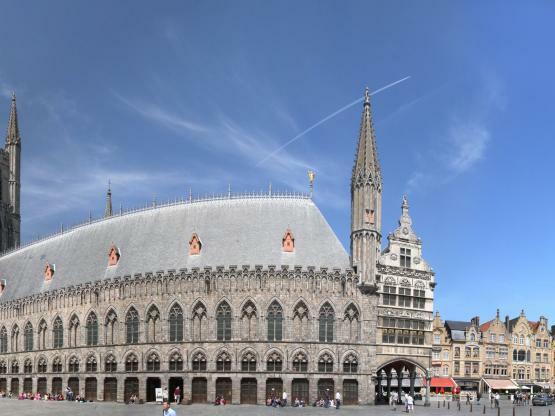 But many attractions and sites in the Ypres city centre also refer to WWI. The most important and most visited is the Menin Gate. Every evening, at 8 pm sharp, the Last Post is played there by volunteers of the Ypres Fire Brigade. There are also two cemeteries of the Commonwealth War Graves Commission in Ypres, the small and intimate Ramparts Cemetery on the Ypres city walls near the Lille Gate and the larger Ypres Reservoir Cemetery. Brits, Canadians, Australians, New Zealanders and other nationalities from the British Empire who fought here, are buried there. Various monuments or memorial plaques referring to the involvement of a particular nationality can also be found. Like the Irish cross in the garden of the Saint Martin's Cathedral and an Australian plaque at the Menin Gate and an Indian monument. There is also a Belgian monument and memorial for the civilian victims near the Cloth Hall. The Saint Georges' Memorial Church is also a much visited remembrance site.